Stand Up Paddle Surfing: Paddle power breakfast... Maui-style! Breakfast #1, Lulu's Restaurant, Lahaina: Kimchee fried rice (it's gone by 9am so get there early! 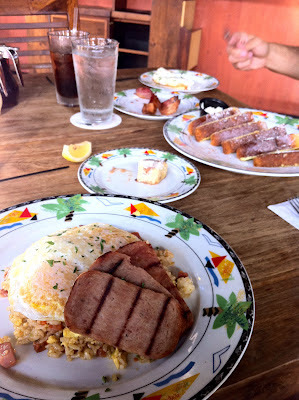 ), eggs over easy and three grilled pieces of spam... paddle like a maniac all day long. Paddle Surf Baja: It ain't easy.